I spent Saturday afternoon with my mother making pizzelle. 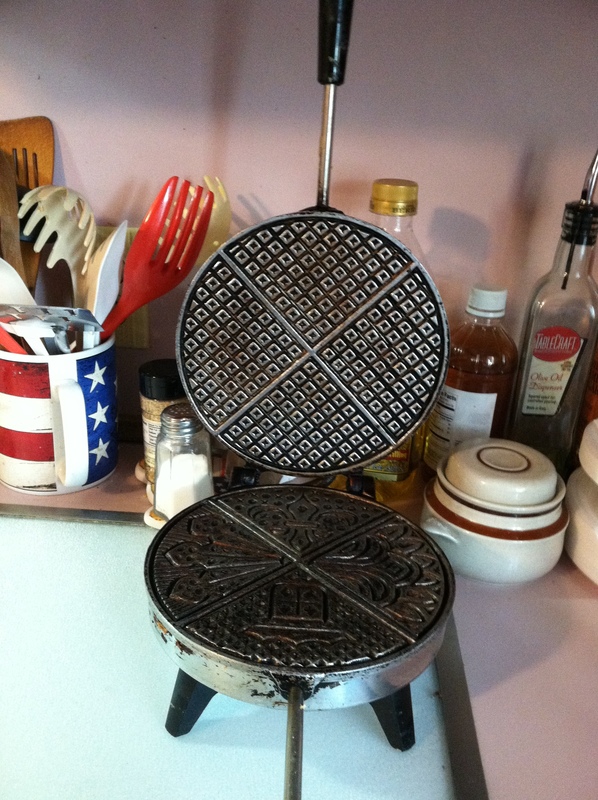 I have always been fascinated with the pizzelle iron as a child. My mother got her iron forty three years ago on her 25th wedding anniversary as a gift from her mother-in-law, my Grandma Jennie. I told my mother that when she croaks I get the iron. I talk in this ‘tough egg’ manner when I don’t want to confront the thought of ever losing her. It beats the alternative of feeling weepy at the thought of my mother not being there when I call her, of no one to tell me when I’m acting ridiculous, or hugging me gently on the way out the door and calling me a scallywag, whatever that is. As a child, I spent countless afternoons watching my mother at the pizzelle iron, as she pressed the batter down and wiped the edges of the iron with a cloth to avoid ridges at the ends of the waffle cookies. I was never allowed to touch the iron, which is probably what drove me to want to make them now. At 48 I’m probably old enough now. But you would never know it. My 88 year old mother anxiously watched as I used the iron like a big girl. Big, middle-aged, old lady girl. The dynamic has not changed and it never will. I’m glad for it as it is a constant I can depend on for a while longer, as long as I am fortunate enough to be a phone call or a drive down the road away. I would be remiss if I didn’t provide a little pizzelle history here. But rather than plagiarize directly from the internet, here is a link that provides some interesting tidbits. One thing that resonates with me after reading this is the family connection. They are part of special family celebrations like weddings, Easter, baby showers, Christmas, any occasion that brings the family together. I love pizzelle because they aren’t too sweet, you can make them any flavor you like within reason (we did chocolate and pumpkin spice for thanksgiving), they are great with a cup of coffee or tea, and, now that I am a big girl, they are really easy to make. Flavoring of your choice- 1 teaspoon of either vanilla, orange, lemon, anise, rum or almond extract. For chocolate, use ¼ cup baking cocoa. Or, you can toss in a shot of anisette, or rum, or whiskey. Use 1 tsp. cinnamon, 1 tsp. nutmeg and ¼ tsp. clove for pumpkin pie flavor, or use pumpkin pie spice. Then beat in the dry ingredients and sugar, along with the flavoring. For chocolate, take some baking cocoa (1/4 cup) and some water and mix in a small bowl until the cocoa is dissolved, then add to the pizzelle batter. The batter should be stiff, but not doughy. It should be able to stand up when you spoon it up. A little thicker than a meringue. This from someone who doesn’t bake, but loves to eat. It’s airy like meringue but has a little more body. Preheat the pizzelle iron. Usually a little light on top will light when it’s ready. You can spray it with PAM very lightly before you start, but if the batter’s right they really won’t stick. Put a heaping tablespoon full of batter on the center of the hot iron and press. Give about 30 seconds and lift. The cookie should be tannish, not too white. Of course with the chocolate you have to be a little more careful not to overcook. You should be able to lift the cookie up with a fork and place it on a plate. It should pick up without drooping or being too doughy. Pizzelle have to cool for a few hours at least. Spread them out on the platter after cooking versus keeping them in a big stack. Once they are cool, you can sprinkle them with powdered sugar. The longer they stay out the crisper they will be. Don’t wrap them up too quickly or they will be soft, which you don’t want. Pizzelle should be thin and crisp, not soggy. Pizzelle can be stored in a tin for at least a week, maybe more. They look pretty on a plate wrapped in cellophane with a ribbon. That’s usually how they are displayed in bakeries or on the table at an Italian wedding or baby shower. This entry was posted in Aging Parents, Food, Italian Americans and tagged almond, anissette, chocolate, extract, Family, iron, Italian, italian american, lemon, mother, orange, Pizzelle, rum, vanilla, whiskey by pattytmitchell. Bookmark the permalink. Thank goodness! Luckily there is a long line of people out there willing to point out my flaws!! Ummm…what a warm, wonderful memory you invoke, especially of the pleasant smell. And more importantly, of the wonderful bond you’ve created with your mother. Thank you Barbara. As I’ve written here before, the whole ritual behind preparing food together allows us to create such bonds. It holds a special power over us all, and I’m amazed by it all. I love the sense of family connection that shines through in so many of your posts. This one brought back memories of a family on the street I grew up on. The old grandmother woul amke pizelles for any child in the neighborhood who had a birthday (and there were many of us). She would ask our favorite flavor and make them for us–a special plate we could eat all on our own, share with our family, or share amongst our friends. A very touching memory from my childhood and a lovely sense of connection with others in the world. Thanks for sharing a bit of your family with your readers! Laura what a great story! Thank you so much for sharing. 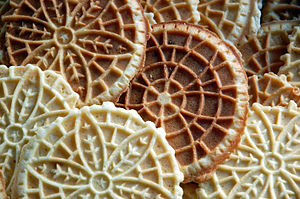 Pizzelle are a special treat and I’m sure all those kids really appreciated such a thoughtful gift. What a wonderful woman. I remember the pizzelles my grandmother made. Though I did not inherit her pizzelle maker, nor can I finf out who did, I do have La Chittarra… used, as you know, for making spaghetti…you know, by pushing the fresh dough through it. I think my grandmother had a spaghetti machine but I need to confirm that. It may have been Grandma Testa not Fiore. Most of the pasta my grandma Fiore made was rolled out noodles with no machine. I love that pizzelle iron though. And the cookies of course.